Made Split Pea Soup and French Dimpled Rolls for Thanksgiving dinner. I borrowed the help of my slow cooker; making the soup was a breeze! This is the first time I tried making bread from scratch, kneading the dough by hand is fun! It has turned out much better than I thought. Wash and drain the split peas. Arrange them in the slow cooker in an even layer. Add the diced carrots, celery, potatoes, chopped onion, minced garlic, bay leaf, and thyme. Place the ham bone over the vegetables and add the chicken stock. Add 1 tsp salt and 1 tsp pepper. Cover and set the slow cooker to cook for 8 hours at low temperature. After 6 hours, remove the ham bone and let it cool on a chopping board. Remove the meat from the bone and dice into small pieces. Return the meat to the slow cooker. Scoop half the soup with the vegetables into a deep pot. Using a hand blender, blend the soup until the mixture is thick and smooth. Return the blended mixture to the slow cooker. Let the soup simmer for the remaining two hours. 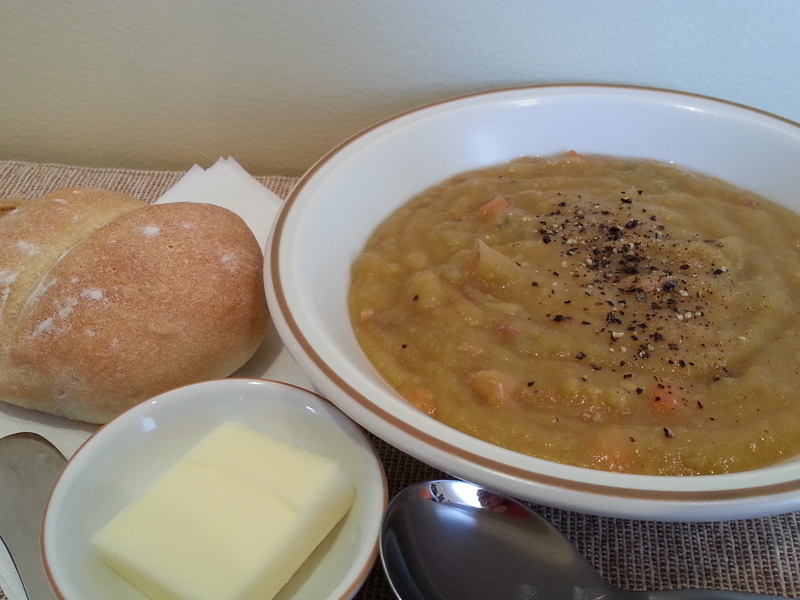 Enjoy a thick, hearty, and chunky split pea soup. Sift the flour and salt into a large bowl. Stir in the sugar and make a well in the center. Mix the yeast with the lukewarm milk until dissolved, then pour into the center of the flour mixture. Sprinkle a little of the flour from around the edge. Let it sit at room temperature for around 20 minutes or until the mixture starts to bubble. Add the water and gradually mix in the flour to form a fairly moist, soft dough. Turn the dough out onto a lightly floured surface and knead for 10 minutes until the dough is smooth and elastic. Place the dough in a lightly oiled bowl, cover with a lightly oiled plastic wrap and let it rise, at room temperature, for about 1 1/2 hour or until the dough had doubled in bulk. Turn out on a lightly floured surface and punch down. Cover and let dough rest for 5 minutes. Divide the dough into 10 pieces. Shape into balls by rolling the dough under a cupped hand. Lightly flour the top for the dough balls. Space the dough balls apart on the baking sheets, cover with a lightly oiled plastic wrap and let it rise, at room temperature, for about 30 minutes or until almost doubled in size. Lightly oil the side of your hand and press the center of each roll to a make a deep slit. Cover, and let it rest for 15 minutes. Preheat the oven to 450 degrees F. Place a roasting pan in the bottom of the oven and pour 1 cup of water into the pan and bake the rolls for 15 minutes or until golden.